Stock Photos have become more popular now than ever before. Why? Imagine the cost and time associated with commissioning a professional photographer to capture just the right picture for your next project. That effort could cost hundreds or thousands of dollars. Stock photography companies provide millions of royalty-free images for you to use in your projects. In a matter of minutes you can have the perfect photo in your hands with the right colors and props, and at a very affordable price. From the convenience and comfort of your office or home, you can quickly find the stock photo you need by accessing one of many professional stock photo websites. 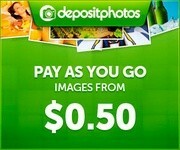 Deposit Photos offers a huge selection of stock photo images for any project you may be working on. The flexible, yet affordable pricing and search engine functionality makes Deposit Photos stand out among the competition. Dreamstime is a stock photo website with more than 46 million images. They have a competitive pricing structure based on the size of an image and number of times it has been downloaded. Also, in an effort to provide quality to their customers, Dreamstime reviews submitted images and rejects those that are not of the highest quality. Dreamstime checks all the boxes and that's why we recommend them for your next stock photo purchase. Big Stock provides a huge database of stock photos at affordable prices. If you're in need for a few or even several thousand photos, Big Stock has a great selection that will fit into your budget. Think Stock provides shoppers a good photo stock experience. We liked the quality photos and the huge selection. For customer looking for 5 images or more Think Stock is worth a second look. Getty Images has an impressive list of stock photos to choose from. The search functionality was also second to none. Getty is definitely geared for companies with big budgets and the highest quality needs. iStock Photo caters to those businesses or individuals with with infrequent to small projects. They have made improvements in their preview quality and browsing experience, and offer a wide range of stock photos. We were less impressed with the quality of images at Crestock and found the database of options a bit redundant. If you are looking for quality stock photos we recommend you shop a higher ranked company. Selection. Having millions of stock photos available at one website improves the likelihood of finding the one you're looking for. Price. Stock photo prices can vary greatly. Be aware of the average cost of each image before buying credits. Also, look for subscription and membership options if you need a large number of images. Quality. Successful stock photography companies utilize high quality photos that will add value to your website and advertising. Look for companies that provide artistically high quality work to choose from. TopConsumerReviews.com has reviewed and ranked the best stock photography providers available today. We hope these reviews help you find the right stock photos for your next project! From Crystal Lake Central High School: Elena Starcher, a senior at Crystal Lake Central High School, was awarded a national silver medal in photography by the Alliance for Young Artists & Writers.